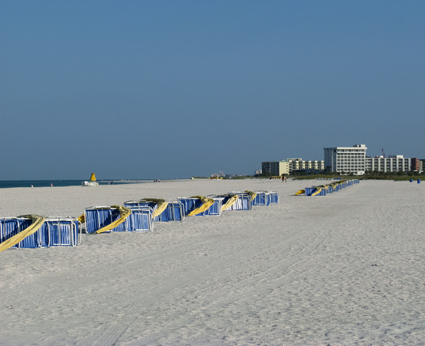 Beach workouts on your Florida vacation can help you maintain your fitness. Beach exercise doesn't have to be restricted to just beach running. You can be creative in your beach body workouts, but just make sure you plan ahead. If you are intent on doing something to stay in shape during a short vacation to the Florida beaches, and you don't have a gym near you, our beautiful outdoors can help. There is one thing to keep in mind though, if you plan on beach workouts...you are going to get hot (even in the morning), you're going to get wet, and you will have to deal with the sand. I know how romantic, perfect, and idyllic those picturesque photographs look in travel magazines and on the Internet, but real life can be a bit different. Many of us here on Florida Gulf Beaches workout almost daily, and we've learned a few tricks. 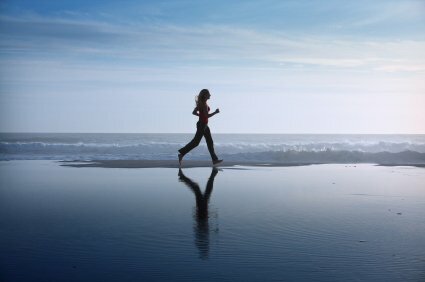 I know when you are on a Florida beach vacation, you want to live as carefree and uncontrolled by everyday demands as possible, but an hour's worth of planning your first day will make your workouts much more pleasant. When you get to your beach rental, take 30-45 minutes and walk a bit in each direction. Put your focus on observing how you can use the surroundings to create a solid workout plan. 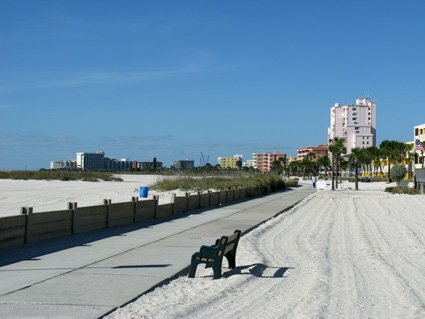 The above picture shows the Treasure Island Beachtrail, that runs behind many motels along Gulf Blvd from 104th Avenue to 120th Avenue...about 1 mile. Just a cursory glance shows a paved strip where you can walk/run without getting your shoes wet, and a bench where you can do elevated push-ups, or supported rear dips...or utilize the high back to help stretch your hamstrings. 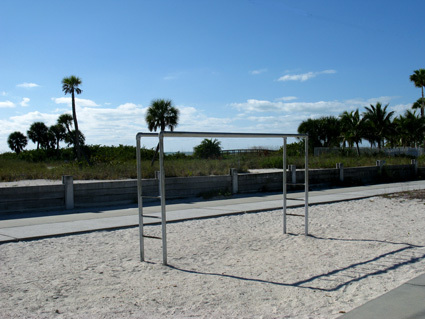 If you can find a play ground right on the beach, or even an overhead ladder like there is here on Treasure Island, you can add some pull-ups to your program. I use this every day. 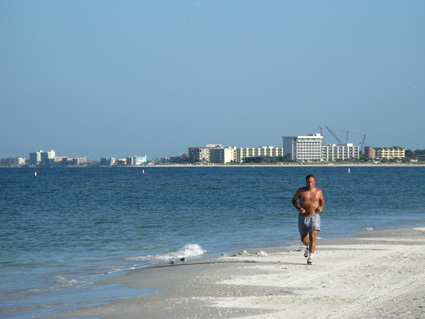 When you workout on the Florida beach, you will be dealing with heat, humidity, wind, sun, sand, and water. Even if you exercise at sunrise, like many of us because it is much cooler, you will still face some measure of each of these elements. When you run on the beach, you'll find all kinds of things to checkout. Here a runner is resting on the Sunset Beach Jetty before turning around to head back north up the beach. Even on a cold, January morning, the pull of running in Florida's beautiful outdoor setting draws both locals and visitors. 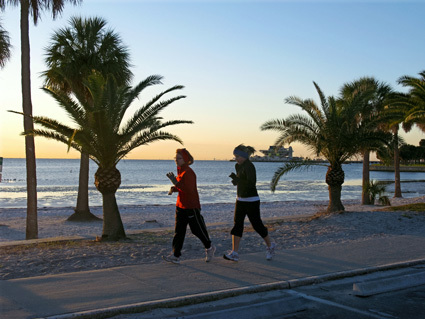 It may be a bit cold in Paradise, but these two ladies are getting in their running along the St. Petersburg Waterfront Parks system in downtown St. Pete as the sun comes up over North Shore Beach on Tampa Bay. Sometimes, it's fun to do a beach workout with a partner. Just make sure your expectation levels are equal to each others' abilities. Exercise on your Florida beach vacation is mostly just maintenance, not competition with someone you love. However, if you are here with a buddy...all bets are off. You can think up all kids of competitive events for your beach workouts. Still, if you are by yourself...you can get as crusty as you want in your quest to complete your personal beach body workout. Not everyone on the beach wants an intense exercise program. Some people come to the Florida beaches to connect with Nature and their own spirituality. Don't be surprised to see people doing yoga early in the morning. Whatever form your beach workout takes, I wish you much good health and a wonderful Florida beach vacation. I love living here and I want you to have a visit filled with great experiences. Maybe you'll move here to join us.